Fully balanced and unbalanced inputs and outputs. High Impedence Direct Input for Guitar , Bass , Keyboards or line level signals etc. The New Sebatron THORAX is an evolution from previous models most notablely in Frequency Response , Dynamic Range , improvements over noise floor and compression characteristics. Quality components and build make this Valve Microphone preamp and Compressor a must for any Professional recording setup. This controls a full thirty db swing and acts as a pad control when rotated fully left and a gain control when fully set to the right. Everything from close miced drums to gentle acoustic overheads can be handled and controlled through the useage of this pre control.The Pad/Gain control is a dual feature parameter that acts as a pad for dealing with heavy mic/line signals by varying negative feedback between the input and the first valve triode stage and by also controlling the interstage coupling level.The pad/gain control provides just over 30db swing that allows the user to comfortablely deal with heavy audio signals ( up to +10db ) with a very transperent reponse but also able to drive a signal into mild to heavy distortion if required.This means that anything from close miced drums to line level signals through the Direct Input or Mic input can be delt with and processed by the AXIS/THORAX preamp stage . Passive means that this stage doesn't have an active gain element which means by switching this feature into the signal path , there will be no added noise , distortion or colouration.This filter is useful on many sources particularly voice or guitar to eliminate very low frequencies that will subsequently eat into the dynamic range of the signal yet offer little or no real musical value.Sometimes vocals will 'sit' better in a mix if the lower frequencies roll off fairly high.Easy to put back in at mix time if needed , but better eliminated earlier on rather than latter. The interplay between the 'colour' and variable Hi-Pass can sometimes also provide interesting creative textures to work with. The Output level control provides up to another 30db of gain , however control is clean and transperent through the whole scale.From mic input to final output , the THORAX/AXIS preamp stage can provide up 70db of gain. 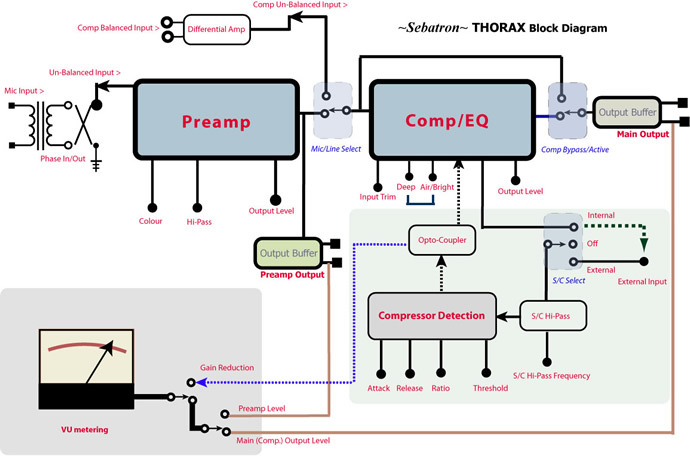 The THORAX Equalizer is intergrated into the optical compressor to preserve the integrity of the audio signals. This is the reason why the two components can't be accessed individually. The Equalizer is boost only and based around two primary bands , Deep and Air/Bright. The 'Deep' control peaks quite low at 80Hz but has a smooth 6db per octave rise however as this dial is increased so is a percievable 'enhancement' quality to the bottom register that seems to 'thicken' up the signal. Ideal for Bass , Guitars , Keyboards or Vocals where the original signal may be too thin or narrow to commit to proper recording. The Air/Bright is switchable from 10Khz ,12khz or 14Khz . These are delicate boost EQ controls that are designed to sweeten up the signal with little or no signal artifacts. The Optical Compressor is a feedback design and therefore is also post EQ. Detection takes place after the EQ to increase the overall depth of the compression amount. The Compressor Detection circuitry has been optimized for fast , tight charactersics but also has significant flexibility to mimic some classic slower time curves of the past. The fully variable attack/release controls allow the user to easily fine tune the compression envelope and the Ratio control is invaluable for providing the gateway into compression that is neither heard nor unheard. At the far left setting , the ratio control operates at the minimum and careful alignment with the envelope can provide a compression characteristic similar to analoge tape. Particular attention has been made to compression depth so signals can be subtley compressed or heavily slammed. The compression 'mode' is setup by the 'tight/smooth' control toggle. This is similar to Peak/RMS switching but a little more extreme and linked to envelope response. Gain makeup is all valve and the interplay between the input trim control and output level control can create some interesting and organic textures to signals. If injected from the AXIS end ( D.I input for example ) the signal can be driven up to the point of saturation via the use of all the four gain and output level controls . The compressor stage features balanced and unbalanced inputs/outputs that can handle a wide range of levels from cold to hot.Two of these stages can be linked up via the side chain input on the back to form an accurate stereo buss compressor. Mixes can be processed in an organic manner when run through the THORAX circuitry even with no EQ or compression. Build : Chassis is 1.2mm mild steel powder coated 'Textured Black'. Front Panel is 2.5mm mild steel powder coated 'Transformer Grey'.